Manometers are one of the oldest type of pressure measurement. Manometers can be used to measure gauge pressure,differential pressure and absolute pressure. U tube is made of glass.The tube is filled with a fluid known as Manometer fluid. 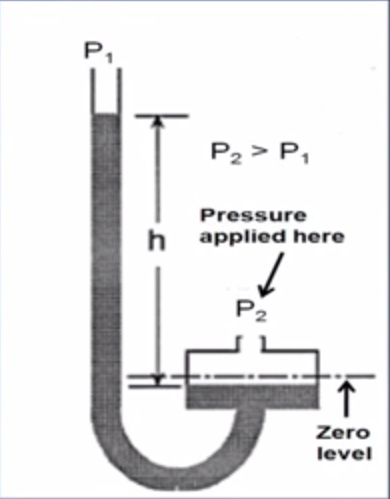 If the manometer is connected to same pressure source (P1 = P2) the level of the manometer will be same. 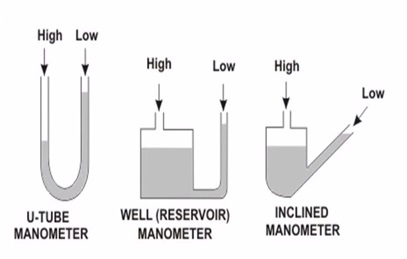 If the manometer is connected to two different pressure source there will be a difference in level of the manometer fluid in both the limps. While choosing the manometer fluid for a particular application we need to remember following things. 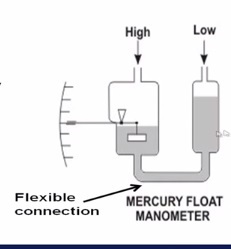 Mercury is one of the most commonly used manometer fluid. 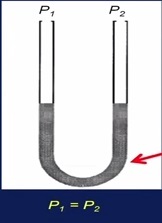 In a well type manometer,one leg is replaced by a large diameter well.Since the cross sectional area of the well is much larger than the other leg,when pressure is applied to the well,the manometer liquid in the well lowers only slightly compared to the liquid rise in the other leg.As a result of this,the pressure difference can be indicated only by the height of the liquid column in single leg. If the area of well is 500 or more times larger than the area of vertical leg,the error involved in neglecting the area is negligible. The inclined leg expands the scale so that lower pressure differentials may be read easily. Sensitivity of the manometer increases. The scale of the manometer can be extended greatly by decreasing the angle of inclined leg to a small value.